Thanks a bunch! See you there! I wanted to merge my running and food blog into one place and tie everything all together. In a few months I will be finally graduating college. What will I do when I graduate, well dude we just don't know. I thought about graduate school, it would be nice. To be honest with you I am quite tired of school and need something different. Seeing as being a housewife does not pay the bills, although Matt says it pays in kisses but Verizon recently informed me that 113.45 kisses will not cover our bill, I will probably find myself working in an office somewhere. Hopefully a job where I can do my own thing at work. I do intend to keep my education going though. While attending my own new school. I think I will take classes on beer, wine, cooking, baking, cheese, and other edibles. I'll work on my cooking and writing about it. And I will work so that I can also afford myself some travel. I will freelance for myself. Maybe one day I will land myself a cook book deal, or open my own brewery. When I was in Japan I found myself marveled at the various food stalls scattered all about Tokyo. I missed out on trying many of their treats since I was on a strict gluten-free diet at the time. The one I wanted to try the most was the takoyaki (たこ焼き), grilled octopus balls made from a pancake like batter and chopped ocotopus (tako たこ in Japanese). poured in to a cast iron grill of little half domes and grilled. I found myself mesmerized as I watched skilled takoyaki chef's hands fly across hot griddles 100 takoyaki wide with a small tool in hand, which looks like the metal nut pick my parents always kept in the nut dish around the holidays for picking walnuts out of the shells, flipping the octopus balls 180 degrees with such speed and precision all with out missing a beat flipping rows and rows of the little octopus balls putting on quite a show. 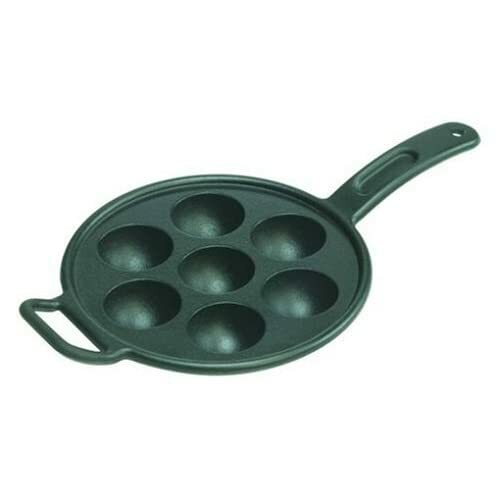 Behold-the Aebleskiver pan, the dutch version of a takoyaki maker, which lets me know that it was meant other uses which I do not need to make up. This is meant to be in my home making octopus balls, mini jelly doughnuts, apple dumplings, brownie balls, croquettes and the most amazing sunny side up eggs that protect the yolks. As I was writing this post I stopped and I ordered it. My new aebleskiver pan will be here in 5-8 days according to Amazon. Something with the cannoli filling I plan to use the ricotta for. Possibly a fruit salsa too. Sunday I met up with friends who are leaving the US this week for good and going back home to their home countries. So we met up at Moustache Pitza in the west village for lunch. Moustache Pitza is a middle eastern place, with a big focus on fresh baked pita breads that arrive to your table hot, and puffed up like a blowfish. The food there is amazing, everything is fresh and you can count on a waiting a bit for your food (even when it's slow there) but believe me--it's worth it. My friends Christy, who is going home to Malaysia, is also doing the Omnivores 100, so when we saw baklava on the dessert menu, it was decided even before we ordered drinks. So after a delicious lunch of hummus, pita bread and various "pitzas" which we all shared, we ate baklava. So now about the baklava. It was pretty tasty, but I wasn't a huge fan. The crust was flaky and buttery with a nice golden top. The filling was full of nuts and a tad dry. I think it was too much for me, too many nuts.I would have liked some dried fruit maybe some raisins in it along with the nuts. I was expecting a sweeter flavor and a moister filling. Baklava is on my Cook's 100 list, so when I make it I think I might like that one better. That's really all I have to say about the baklava. We went to Matt's grandma's for a 5th of July BBQ today. She loves deviled eggs, quite possibly more than me. So I try to make them for parties and holidays there, and to justify owning a deviled egg plate. new aside from the standard deviled eggs I make. So I present you with herbed deviled eggs. After eggs have been boiled, peeled and cooled, carefully slice each egg in half lengthwise. Use a spoon to scoop out the yolks into a bowl. After I scoop out all the yolk, I like to gently rinse out the inside hollow of the white. I think it keeps them looking nicer afterwards. Mash yolks up with a fork. Place yolks, and all other ingredients in a food processor, and pulse till mixture is well blended and smooth. Place eggs whites in an egg dish, or cover a plate with salad greens to prevent eggs from sliding about, cut a small corner from zip top bag, and pipe into egg halves. You can easily make these ahead of time, a day or two. I keep the yolk mixture stored in the bag, and the whites stored in a container with a lid. This makes bringing them else where much easier, and they assemble quickly.